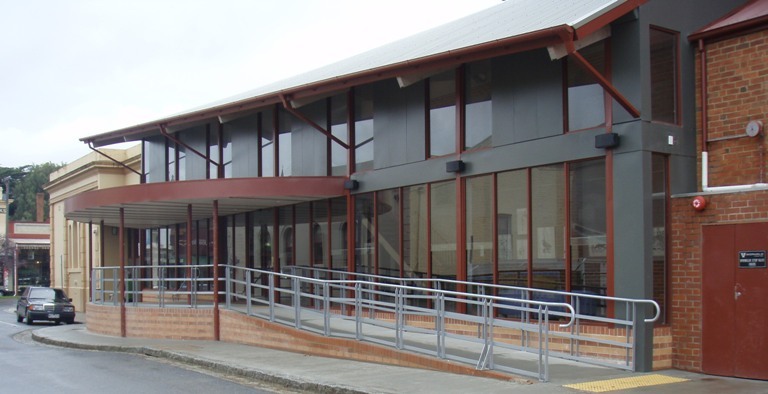 Mount Alexander's library services operate out of Castlemaine Library. Mount Alexander's library services operate out of the Castlemaine Library, housed in the historic (1857) Mechanics Institute building facing busy Barker Street, with entry from Mechanics Lane. Castlemaine is a branch of the Goldfields Library Corporation, a regional network whose other branches include Bendigo, Kangaroo Flat, Kyneton, Woodend, Gisborne and Romsey. Members of Castlemaine Library have access to the resources of the entire Goldfields region. Library membership and borrowing are free of charge. Available for loan is a range of fiction and non-fiction to suit all tastes and ages, as well as magazines, children's picture books, music CDs, DVDs, talking books, large-print, and adult learning materials. Computers can be booked for internet access and word-processing or bring your own laptop and make use of the Library's free wireless internet. Also available are a photocopier and printer (charges apply), daily and local newspapers for browsing, and a community noticeboard. Castlemaine Library's collection is especially strong in the areas of art history, arts and crafts, gardening, and sustainable living. An extensive collection of local history resources includes the Midland Express/Castlemaine Mail newspapers and early municipal ratebooks on microfilm and the Verey Collection of digitised historical photographs. For children, there are storytime sessions as well as special school holiday activities. Book groups and a poetry group meet regularly in the Library. The Friends of Castlemaine Library (FOCAL) provide support with book sales, fundraising, creative initiatives and events. In the eLbrary you’ll find a range of free eResources, including books, audio, magazines, newspapers, kids stories and activities, music, dance, film, computer and business training, languages, family history, reference and more. For more information on the recent change in opening hours read or download the flyer.